Like a somber “talking-to” from a family doctor, Superstorm Sandy forced New Yorkers to face an uncomfortable reality: the irresponsible lifestyle we have lived for so long has put us at risk, and we must take significant measures to preserve our health going forward. It will take a dual approach of both sustainability and resilience to prevent and respond to the threats of climate change. These issues are as important as they are complex, so let’s borrow some familiar concepts from medicine to understand what they mean for the health of our city. In healthcare, we recognize a need for both preventative care — avoiding problems before they arise — and curative care — anticipating problems that will come about despite our best efforts to prevent them. The health of the urban environment is no different. When it comes to climate change, sustainability means “reducing it” whereas resilience means “reducing its impacts.” In one case we are trying to prevent something from happening, in the other we are trying to mitigate the negative impact when it does. While the two issues are complementary, their differences are important. “Sustainability” and “resilience” are not synonyms, but rather complementary forces, a yin and yang, which must be tackled in equal measure. “Resilience” is one of those terms that sprung from obscurity after the storm, suddenly popping up in mayoral speeches, campaign platforms and government-commissioned reports. As with many conceptually dense terms that abruptly enter the social consciousness, it is widely misunderstood. Resilience is often mistaken for another term that we’ve heard a lot about lately: sustainability. While many people fall into the trap of mistaking one for the other, it is actually easy to distinguish between them. 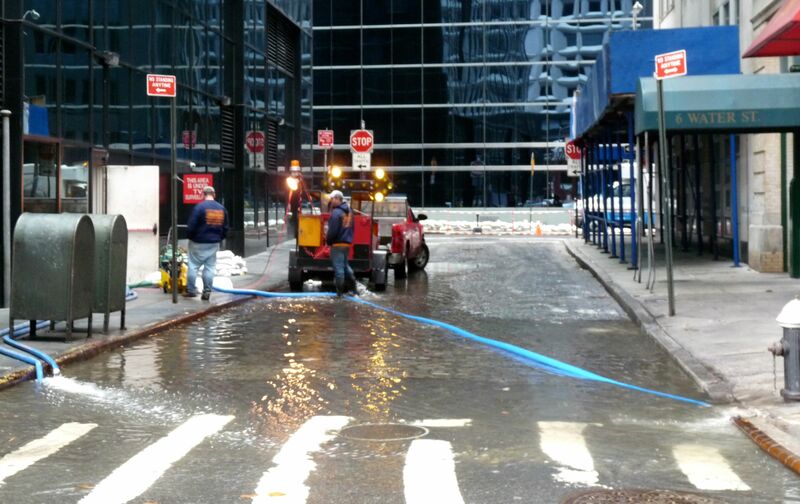 In a nutshell, resilience includes “adaptations to our environment to increase the ability to withstand and recover quickly from weather-related events.” Here in New York, it speaks to the need to protect the buildings, transportation, infrastructure and people from gradually rising sea levels and storm-induced surges. Meanwhile, sustainability is the never-ending pursuit of reduced environmental impact to limit climate change. It encompasses clean energy, waste and water management, and, in a city where 75% of greenhouse gas emissions come from buildings, energy efficiency. Suppose you are the mayor facing a completely different social problem- an imminent flu epidemic, for example. The “sustainability” measures needed would include vaccination efforts and hygiene campaigns to limit the scale of the outbreak. The “resilience” measures you enact would include increasing access to medicines and enabling hospitals and clinics to handle the influx of patients to treat those who fall ill. Government leaders must understand the importance of both approaches or risk an anemic response. Complicating matters is the fact that we are one of many players in a complex network in which the forces of climate change have already been set in motion. Global climate systems will wreak havoc on New York City despite our best efforts to prevent them. But we still must try. There is a social contract in effect that demands everyone’s participation and protection. When parents vaccinate their children, they do so first and foremost for their own child’s sake. Yet, in aggregate, their efforts lead to widespread impacts. Through “herd immunity”, a society can effectively eliminate a threat that might have otherwise been a public health disaster. On the other hand, a high proportion of unvaccinated people can lead to broad negative impacts, where those who are too young, too poor, or too ill to be protected are put at risk. When it comes to severe weather, New York City is certainly among those most vulnerable, with its vast resources clustered so close to sea level. If we all participate, there can be real reduction in greenhouse gas levels, yet if enough cities or nations fail to participate, they will diminish the efforts of the others. Here’s the good news: New York is on track to be a national and international leader on environmental issues. While we cannot hope to influence global climate trends on our own, we can be a positive force for increased sustainability that can make a tangible difference. In 2007, New York City adopted PlaNYC, a set of interrelated policies with a shared goal of reducing greenhouse gas emissions by 30% by 2013. One component of PlaNYC is a mandate that large buildings complete an annual energy benchmarking report (Local Law 84 of 2009). Similar legislation has now been passed in major cities around the county: Washington DC, San Francisco, Austin, Boston, Chicago and Seattle all have energy benchmarking laws aimed at improving building efficiency. Together, these cities make the whole herd safer. By taking the first step, New York has blazed a trail for sustainability with a widespread positive influence. While the analogy is useful, climate change is not just a metaphorical health threat: extreme weather and other consequences of climate change can have life-threatening impacts. The challenges are daunting and the issues complex, but with greater understanding and sustained commitment, we can have a strong positive impact. With a new mayor coming into office on January 1, 2014 New York City has the opportunity to build on the significant environmental efforts of Mayor Bloomberg. As of September 24, 2013 resilience was added to the scope of the Office of Long-Term Planning and Sustainability.Meanwhile, millions of dollars in federal aid remain to be spent on post-Sandy recovery and the City Council currently faces proposed legislation that covers broad environmental issues including plastic bag management, building heat retention, and flood management. Bill de Blasio has the power to sign or veto these bills, and, if they become law, his administration will have the responsibility to implement similarly progressive legislation. Change happens whether we like it or not, but we are not helpless spectators. Sustainability efforts to lower greenhouse gas emissions can reduce the frequency and severity of extreme weather events. Resilience measures to buttress our defenses can diminish the consequences of what we fail to avoid. There cannot be one without the other. The health of this City depends on our ability to apply this lesson. Re-Sus-Citate New York! This entry was posted in Non-Fiction and tagged de blasio, new york city, nyc, resilience, sandy, sustainability. Bookmark the permalink.